The ILIAD project has demonstrated key aspects of an autonomous forklift truck fleet including the ability to map its surroundings, navigate, be assigned tasks and detect humans. A set of demonstrations were held at the National Centre for Food Manufacturing in Holbeach, part of the University of Lincoln, to mark the project’s second milestone after 18 months. It showcased to industry representatives the current level of development of aspects of technology for deployment and operation, from when the ILIAD robot is unpacked at a new site to fleet coordination and object detection. The four year Intra-Logistics with Integrated Automatic Deployment project began in March 2017 with €7m funding from the European Union’s Horizon 2020 research and innovation programme. The project is led by Örebro University in Sweden with partners the University of Lincoln, the University of Pisa, the Technical University of Munich, Bosch, Kollmorgen Automation, ACT Operations Research, Swedish food manufacturer Orkla, and Logistic Engineering Services. The project aims to create self-deploying fleets of robot forklifts needing no special infrastructure in their immediate environment. The robot fleets will offer reliable lifelong operation and will be integrated with a planning system to assign tasks and optimise operations automatically. They will be able to unpack and load items to pallets. They will also be able to detect humans and work efficiently alongside them. The first requirement when introducing a self-driving warehouse robot is to calibrate its sensors. The robots in ILIAD do not use any pre-installed guides or markers. Instead they use on-board sensors to create a map of the surroundings, which is used for navigating and planning. To do this, the robot must know the precise position and orientation of its cameras and other sensors. If, for example, a sensor has been shifted from its factory-default mounting during transport, that would affect the reliability and precision of the robot’s operation. So the first task is to accurately calibrate the sensors on the robot. In ILIAD, a self-calibration routine saves considerable time and work compared with the normally tedious standard procedure using custom-made calibration targets. The user simply has to walk around with the robot for a few seconds while the calibration software is running in order to precisely determine the positions of the sensors. Once calibration is complete, the next step is to construct a consistent map. Traditionally, the truck’s position would be defined by first installing specific markers in its surrounding environment, then manually surveying them, after which they can be used as references to compute the relative position of the truck. In contrast, the robots in ILIAD are walked through the workplace once, during which time they record the shape of this environment, compensating for any drift that occurs while driving, and automatically removing moving obstacles from the map, so that only the stationary structures remain. The map is then annotated to denote the positions where each product is stored, and the forklift truck fleet is ready to go into operation. At present, assignment of places is done manually, but automatic methods to assist in this process are planned by the end of the project. With the fleet connected to a warehouse management system which maintains orders, for each new order tasks are assigned to the fleet, such as a list of objects to be put on a pallet. From information about the shapes and weights of each type of package, the system plans and communicates to the robot how each box should be stacked on the pallet. Once each robot knows in which order to put objects on the pallet, the system plans how the fleet of robots should move in order to fulfil the order. Using the map created earlier, the robots plan and coordinate their paths in real time, without the need to manually design paths or traffic rules. 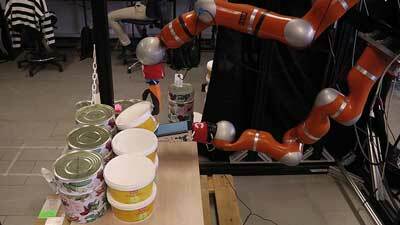 This further reduces the work involved in setting up the system and adds to flexibility, because it makes it possible for robots to re-plan if they encounter unexpected obstacles, for example. A robot arm will be integrated with the trucks. The milestone demonstration also showed a dual-arm manipulator picking different types of objects and stacking them on a pallet in the correct order. This was done via video link from the University of Pisa because the arms are not yet integrated with the truck platforms. A crucial aspect of ILIAD is safe operation among people, and the ability to reliably detect and track humans in the robot’s surroundings was also demonstrated. 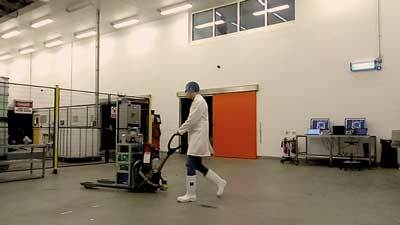 The forklift also showed the ability to detect pallets, using its object detection module. Development continues, with a progress report on the perception system for detecting boxes due this spring. A third milestone demonstration, to exhibit integration of the more long-term aspects of ILIAD, is scheduled for October, at a real-world warehouse of Orkla Foods. The project is due to be completed in early 2021.